Based on the logic that they've applied to the growing pains of Healthcare.gov in its first month of operation, their political party needs to be shut down until they can get this fixed. At the very least, based on their party chairman's logic about Health and Human Services Secretary Kathleen Sebelius, the GOP needs to fire Reince Priebus. 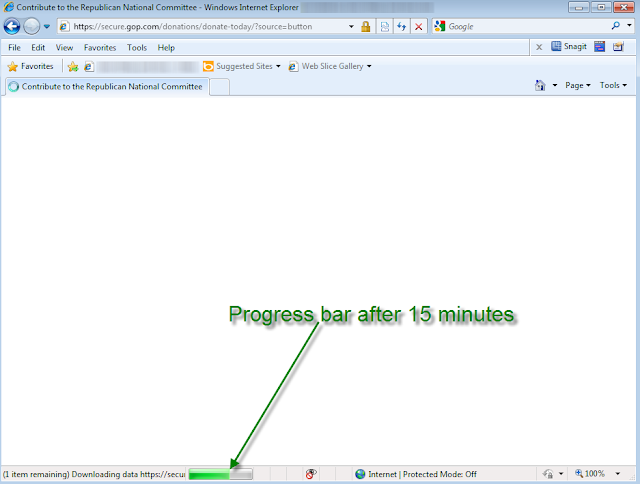 In the interest of fairness, I should point out that the frozen screen up above that appeared in two tries with Internet Explorer was solved with a quick switch to Google Chrome where I was able to "donate" to the party of the rich and their dupes. 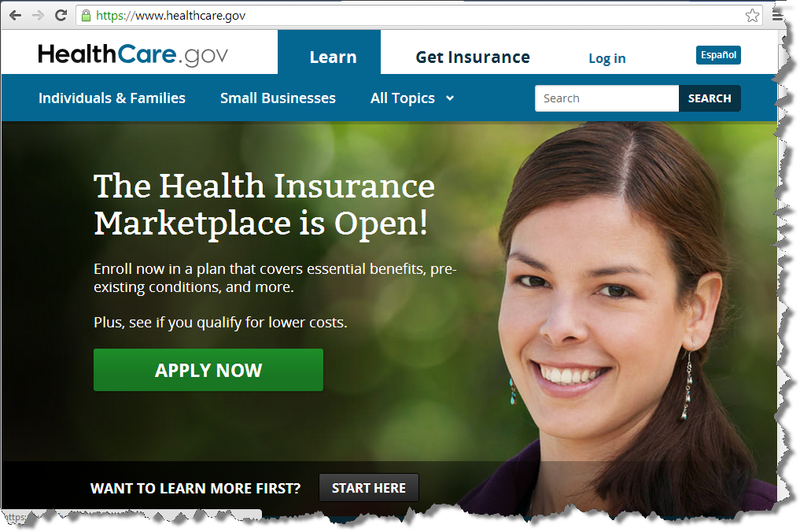 But these complex interactions between browsers, operating systems, etc., are indicative of some of the growing pains the Obamacare site is experiencing too. They will be fixed. 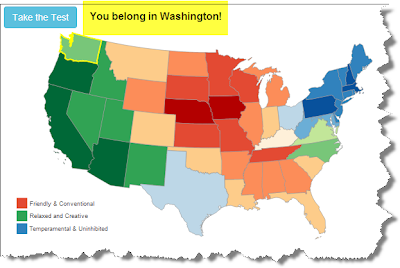 I just took This Quiz and discovered that I should be living 3,000 miles away in "relaxed & creative" Washington State rather than in "temperamental & uninhibited" New York. Take it yourself, though I do think it should take more account of regional differences within states. I'm living in a very relaxed & creative part of New York. There is a brilliant review by Michael Chabon of Thomas Pynchon's Bleeding Edge in the new issue of The New York Review of Books. There's a lot in his commentary on this book I finished reading a week ago that makes me want to drop what I'm reading now and go back and start reading Pynchon again immediately (and when you do read Bleeding Edge, I highly recommend turning around immediately and reading the first paragraphs as soon as you've let the final page sink in). Everything means something, or nothing means anything, and as in every Pynchon novel what can be found is not solution but the grace of moments spent suspended between those certainties. Pynchon's books are the only ones that I religiously buy and start reading on the day they appear, but I've never seen the appeal of these novels summed up as well in a single sentence. And with Bleeding Edge shortlisted for this year's National Book Award, I'd love to see it win just to see who (if anyone) would accept this year. Would that person be able to match Professor Irwin Corey's acceptance speech in 1973 in place of Richard Python? Republicans have turned the National World War II Memorial into the government shutdown’s poster child. But there’s one big problem with their protest: Veterans streaming into Washington to see the monument don’t really face any obstacles in their visits, and many complain that they are being used for political gain. 2016 GOP Clown Circus Update: The Nuge!! Please, please do it! Although if his competition on the Clown Circus stage includes Rafael Edward "Calgary Ted" Cruz and Michele "Crazy Eyes" Bachmann, this gun nut may come off as the sane one. As the lemmings with suicide vests are in the process of flying off the cliff in this third week of the GOP shutdown, it's important to look back at the forerunners of those who are currently waving Confederate flags in front of a black family's house in Washington DC. Specifically, we can't help thinking of March 23, 2003 every time we see the word socialist spelled "scholiast", or fields of waving yellow snake teabag flags, or a tricorner hat festooned with teabags. On March 23, 2003, in the midst of nationwide demonstrations against the Iraq War, one unnamed flag-bandanna-bedecked Urteabagger and future meme confronted hundreds of antiwar protesters outside a Boeing missile factory and gave us the creatively-spelled sign that would launch thousands of imitators as soon as Barack Obama was inaugurated. From a Google image search on the word "Morans"
Mr. Get-A-Brain!-Morans deserves to be the Patron Saint, or at least the Unknown Soldier, of the modern Tea Party. Is it too early to start our Annual Liberal War on Christmas? "All pictures painted inside, in the studio, will never be as good as those done outside." Brilliant. And thank god it's out on the streets and not stuck in one of the national museums that's been shuttered by the Tea Party since October 1. Typical Fox News Viewer's View of #GOPshutdown:"Why did Obama and Reid go out of their way to shut down wheelchair ramps at WWII memorial!?" The photo from October 3 shows the "Barrycade" and "Harrycade" representing the closing of the WWII Memorial, but the photos from September 30 say "SHUT 'ER DOWN! WE DON'T obama CARE!" and the other photos from late September show the thoughtful young 1950's white man in a conservative suit wondering "If there is a government shutdown who will spy on me, waste my money, and have contempt for me?" If these pictures could speak a thousand words (and, of course, they do) they would tell us all about cognitive dissonance and the typical and predictable right-wing media response that focuses on weapons of mass distraction rather than core issues. It was in full display last March when the only sequestration cut complained about on the right was Obama's Heartless and Personal Shutdown Of White House Tours Just To Punish The Children (THINK OF THE CHILDREN!!!). Now, of course, as one troll pointed out to me earlier this week, President Obama and the Democrats are Nazis because they hate WWII vets. 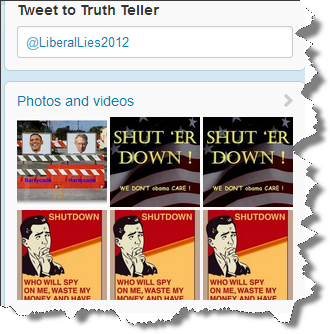 It's not just one random twitterer with 29 followers playing up this single-note response to the current shutdown. Michele Bachmann has made multiple grandstanding photo-ops to the Memorial just down the Mall from the Capitol. Rand Paul has managed to combine GOP distractions in one sentence by saying they sent more security guards to the WWII Memorial than to Benghazi. The shutdown's poster boy Rafael Edward "Calgary Ted" Cruz released an official statement about Obamacare causing the Memorial's shutdown. And to prove that this distraction is an official party policy, Chairman of the RNC Reince Preibus (if that is a real name) has offered to have the party pay for five security guards to keep the Memorial open. Is the Republican National Committee willing to pay for scabs to keep all the other departments of the government working as well? You can tell a lot about a person by the way he treats those he feels are "below" him. Not even the giant American flag in his breast pocket excuses his behavior. Coming Up Next From the RNC/FOX Media Machine: Blaming Obama and Reid for the earthquake that closed the Washington Monument. Here are the results as of 9:30 this morning of an extremely unscientific (think Creationism unscientific) NewsMax ("Independent. American.") poll about the current government shutdown engineered by Ted Cruz, the Heritage Foundation, and the Teabagger Caucus in the House. If you have trouble reading the small type in the screen grab, the first question is "Should Congress risk a government shutdown in order to defund Obamacare?" and 63% say "Yes, cut all funding." 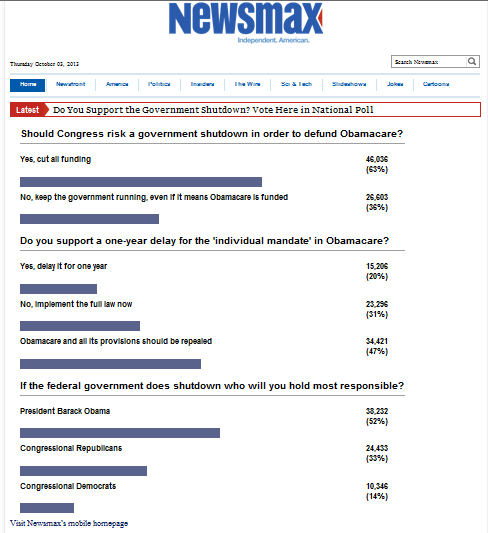 The second question is "Do you support a one-year delay for the 'individual mandate' in Obamacare?" and 47% say the ACA should be repealed totally and another 20% say the mandate should be delayed. Finally, the third question asks the self-selected respondents who they would "hold most responsible" for the shutdown and 52% blame President Obama, 33% the Congressional GOP, and 14% the Congressional Dems. It may seem silly to even glance at these polls, but these polls are the ones that the Tea Party Caucus is using to confirm their ideas (while ignoring the cognitive dissonance between wanting a shutdown in question one but blaming it on President Obama in question three). This is the "majority against Obamacare" they keep mentioning in their speeches. These are also the polls that had the right-wing universe shocked, SHOCKED, when the Romney Ryan juggernaut didn't win by a landslide last November. Despite the efforts of the Tea Party and their stooge John Boehner to extort concessions they couldn't win through legislation, the courts, or the ballot box, the Affordable Care Act will start helping to insure unisured Americans today. They have shut down large portions of the Federal Government causing inconvenience to millions and pain to hundreds of thousands of workers, but HealthCare.gov is up and running.